This Farmhouse Sliding Barn Door is the epitome of rustic chic. 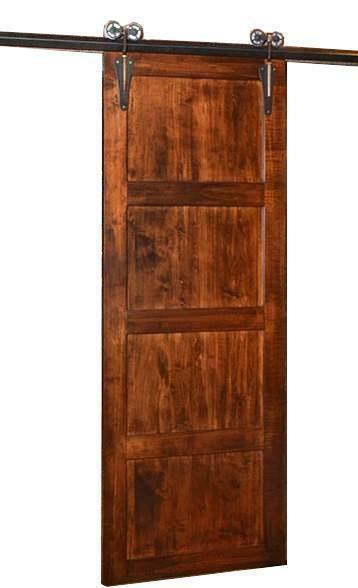 Adding a little country flavor to any modern home this sliding barn door is a space saving solution to any room. Handcrafted out of Solid Wormy Maple by our Amish Craftsman in North America. This stunning Farmhouse Sliding Barn Door can be ordered as a single or double door with a large selection of sizes so you can easily choose the size that best fits your doorway opening. Keep in mind that you will want your barn doors to overhang the opening by a couple inches so there are no gaps when the doors are closed. Select your mounting system which includes an optional mounting board that makes anchoring your track a bit more convenient, a steel track that your barn doors will smoothly glide on when opening and closing your doors, and trollies which connect the doors to the track and come in pairs for either the single or double door set-up. These barn doors are very heavy duty and will require at least 2 people to mount correctly. A contractors assistance is recommended to make sure the doors are mounted securely. Width: 30", 36", 42", or 50"